Because algebra involves a new way of thinking, many students find it especially challenging. Many parents also find it to be the area where they have the most trouble helping their high-school-age children. 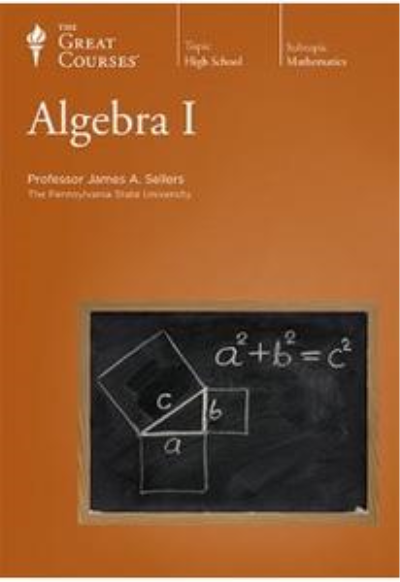 With 36 half-hour lessons, Algebra I is an entirely new course developed to meet both these concerns, teaching students and parents the concepts and procedures of first-year algebra in an easily accessible way. Indeed, anyone wanting to learn algebra from the beginning or needing a thorough review will find this course an ideal tutor. By developing habits such as these, you will discover that solving algebra problems becomes a pleasure and not a chore-just as in a sport in which you have mastered the rudiments and are ready to face a competitor. Algebra I gives you the inspirational instruction, repetition, and practice to excel at what for many students is the most dreaded course in high school. Open yourself to the world of opportunity that algebra offers by making the best possible start on this all-important subject.